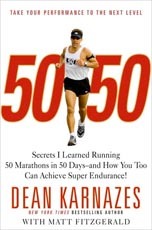 50/50: Secrets I Learned Running 50 Marathons in 50 Days-and How You Too Can Achieve Super Endurance! Discover the secrets for super endurance from one of the fittest men on the planet! Dean Karnazes has run 350 continuous miles through three sleepless nights, ordered pizza during long runs, and inspired fans the world over with his adventures. So what does a guy like this do when he wants to face the ultimate test of endurance? He runs 50 mar­athons in 50 states -- in 50 consecutive days. With little more than a road map and a car­avan packed with fellow runners and a dedicated crew, Dean set off on a tour that took him through a volcanic canyon in Maui in high humidity and 88-degree heat; to an elevation gain of almost 4,000 feet at the Tecumseh Trail Marathon in Bloomington, Indiana; to a severed moose leg found alongside an Anchorage, Alaska, trail that compelled him to sprint for safety. Pace yourself when you "hit the wall"
Packed with practical advice and includ­ing training regimens, 50/50 will inspire you no matter what your fitness goal is, whether it's simply walking around the block, running a 10K, or completing yet another Ironman.